For the region, see France (region). The Hundred Years War which has torn France apart for over a century is currently halted by a truce following a number of key French victories. With the support of Joan of Arc, since martyred at the hands of the English, and the support of the rich Anjou family, Charles VII has reclaimed Paris and many of the French lands. Charles has also been acknowledged as the rightful King by the Dukes of Burgundy in the treaty of Arras in 1435. However, the truce with England is tenuous. The English have still not relinquished their claims to the French throne, and one of the main demands of the new treaty, the surrender of Maine to France, has yet to materialize months later. While the Burgundians now passively support the French cause in the conflict with England, they are still a matter of concern for the French Crown. They have grown their domains far beyond the borders of France, into the Lowlands and the Holy Roman Empire. It is said that the Duke, who is also one of the richest men in Europe, harbors dreams of a future kingdom based around his collective domains. A united France would be one of the richest and most densely populated regions in Europe. If France could bring its many autonomous nobles to heel, and drive the English once and for all from the continent, it would be one of the most powerful states on the continent. Free to pursue voyages of exploration, an active foreign policy in Germany and the Low Countries or even an attack on the rich cities of Northern Italy, where the imperial influence has been waning for centuries. France is a kingdom located in Western Europe, in the French Region, and could be one of the most (if not the most) interesting and entertaining nations to play in EUIV due to its powerful military and amount of flavor events. France allows for the player to make mistakes with usually limited consequences. Due to its military and sheer size, taking down France as an outside nation can be difficult, but not impossible. In 1444, it borders Burgundy to the north and east, England to the north and west, Aragon to the south, Savoy to the east and a large number of minor nations all around. Notable are Provence, the Papal States, and Navarra. France starts out guaranteeing independence to Scotland, in an alliance (as well as sharing dynasty) with Provence, and with cores on all the English land in France. Calais is not in the France region and is therefore not a core of France. French missions are focused around uniting the myriad states in France itself, the conquest of part of northern Italy, messing around in the Holy Roman Empire, fighting the English and kicking them out of the mainland, and colonizing North America. Catholic). 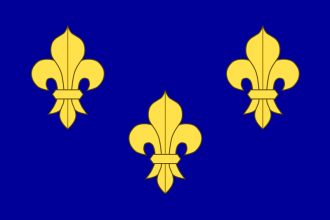 Rival Catholic nations can form La Ligue Catholique, a major player in the French Wars of Religion, directed at the eradication of the Protestants in France. The League was used not only to defend the Catholic cause but also as a political tool in an attempt to usurp the French throne. The formation of the La Ligue Catholique will decrease relations with Catholic nations and give qualifying neighboring powers a casus belli to restore the one true faith! Around 1650, the player will be presented with the choice, through an event, to begin construction of the Palace of Versailles. A high initial cost to set the construction in motion, as well as a temporary but lengthy tax cut, can be a very costly procedure, where several loans might be required. However, finishing the Palace of Versailles will give France the desired model of kingly ruling, and as long as the Palace remains, France will benefit from yearly prestige and legitimacy. This event can occur after 1710 if the French economy is on its knees or is suffering from high War Exhaustion (especially if France has taken a lot of loans) and the probability of the event chain firing is increased if demands for economic and social reforms have been turned down. This event chain can create revolts, uprisings and even the overthrow of the monarchy! Sometime along this event chain, the player may get a general named Napoleon who has high stats. France can be formed by a French, Basque, or Breton country should it cease to exist. This year will mark the beginning of an evolutionary period for our nation. The old feudal ways will begin to make way for a more modern centralized nation. Although struggling financially due to miscalculated projects and military campaigns, we have managed to transform ourselves into one of the most dominant powers of Europe. has never been an end-game tag. has either a culture of the French culture group or Basque or Breton as primary culture. can not be former colonial nation. Maine (177), Berry (179), Vermandois (182), Paris (183), Orleanais (184), Nemours (185), and Champagne (186). gets a permanent claim on every non-owned province in the region of France. changes its capital to Paris (183). The land around the small village of Versailles has long been excellent hunting land, the small hunting lodge has steadily been augmented into a grand looking chateau. Is it not now fitting to make this the seat of the French government? has its capital in Paris (183). has completed the economic ideas. has an administrative technology of at least 16. Granted the right to rule by the grace of God and God alone we should not allow our God given rights to limited by other, lesser, men. has a ruler with an administrative skill of at least 5. The realm was so torn by innumerable factions and sects that the most legitimate of all the parties was fewest in numbers. God has given us strength to stand out against this storm, we have finally surmounted the waves and made our port of safety, -- peace for our state. Catholic and that's the country's dominant religion. does not have modifier “Counter-Reformation”. has the modifier “Edict de Nantes”. loses the modifier “Edict de Nantes”. France should focus on unifying its cultural cores early, this won't be too hard as England has fewer troops than France and is forced to navally invade. From there, France has four common ways to expand: first, expanding into Italy. The French player will often get missions to expand into Italy, which is a rich region and probably has the highest development in the game. However, it is a tightly contested region, and moving into it can make powerful enemies very quickly, especially the Holy Roman Emperor if the player expands there before 1490. If the player wishes to move into Italy, a good way to do so early is by getting the "transfer subject" bonus in the age of discovery. It can be used to have other countries make their subjects the player's subjects pretty quickly. It can be used to gain Naples from Aragon, which is probably most important since it is bigger than any other subjects on the Italian peninsula. Combined with some early conquests in Savoy, France can position itself to dominate Italy early. Secondly, one can expand into the low countries. It is easier to expand into than Italy. Enemies in the region are usually very weak early (with the exception of Burgundy who shouldn't be taken on alone early), and there are usually few other great powers looking to expand into it that early. Like Italy, its provinces are rich and will help France control the trade node shared with the English. However, it is much more difficult to retain. Later in the game, Dutch rebellions are some of the worst in the game as rivals will have the option to defend them. Tlemcen. However, the area is Muslim and has increased coring cost, making it harder to convert and worsening rebellions. The region also has weak development, meaning that the gains made from it are smaller than in Italy or the Low Countries, but it is easier to take and maintain. However, it also opens up more opportunities for easy expansion. If the player is doing this, religious or humanist are a must early on (though religious is recommended for long-term benefits of actually converting provinces). Fourth is colonialism. England, Spain, and Portugal will have better colonial expansion benefits through better settler increase, more colonists through national ideas, and different colonial events. However, France's national idea offers it a chance to go the middle way in colonialism without the penalties. It will get no native attacks and have a very good assimilation rate. This makes France among the best colonial nations if France isn't moving troops into the new world. France also has some unique historical colonial events and missions. Be aware, however, that in multiplayer France will often have strong enemies in the mainland, and oftentimes expansion might not be a good choice for the French player. However, if other usual colonial competitors are not expanding fast, or if you have few enemies in mainland Europe, colonial expansion may be a good choice for France. This war can be started at the beginning of the game. England from the North, a much more secure path compared to the hazardous naval invasion. 100% war-score for mission or strategic purpose. Catalonia and use its cores on the Spanish mediterranean coast to help mitigate aggressive expansion impact in the area. aggressive expansion, over-extension and the high coring cost of these provinces. After this, the game is completely open to the player. If he is doing an active colonial game, France's mighty military will allow him to obtain some achievements that another colonial power would get with difficulty, like Master of India, Trade Hegemon or The Rising Sun. If the player stays in Europe the player will concentrate on the Holy Roman Empire and Austria. He can expand everywhere, the possibilities are limitless. But the player must remember: France is a military power, he shouldn't try to own the trade or to unite the Holy Roman Empire. The goal here is to "paint the map", to conquer, to get big through the military. aggressive expansion in all of Germany by 50% and the Player will be able to easily conquer the German minors now that no Emperor will defend them. This choice will allow better relations with neighbors and will avoid coalitions. The reduced aggressive expansion (-20%) in the "Influence" idea group and the extra diplomat from the diplomatic idea group are certainly the most useful things of this choice. The player will certainly need to colonize a little bit, since building the French army up to the maximum force limit and fully maintaining it provokes a mid-sized deficit to France. Colonizing the Caribbean and Gulf of Saint Laurence trade nodes will fix the economic problem (because these trade nodes are directly connected to the Bordeaux Trade node). If France managed to conquer the British Islands following the strategy above and inherited or conquered the Dutch lands belonging to Burgundy, the player may colonize the Chesapeake trade node, connected to the English Channel trade node, and collect the trade there. Also, the fourth French national idea provides faster colonization and less "native rise" risk. Prussia. The naval bonuses will help to fight off the British navy. Defensive, on the other side, provides cheaper armies and defensive, combined with the second national idea, will provide a huge bonus of +35% morale of armies. More troops are always useful. This combined with quality or defensive will make the French army almost unstoppable. This can also be very helpful if the player is facing a coalition war and has to send troops to all fronts, and of course, more troops mean more units to garrison the New World. Wealth of Nations DLC is enabled. Keep in mind that this is completely optional, and this can change depending on the player's game. Example: If the player is working on conquering Muslims in North Africa, it might be more useful to take religious or humanist ideas instead of exploration or quantity.